This is the first guest post on Quiet Branches. An account of the recent FASEB meeting on Mechanisms of Plant Development. If you want to be a guest contributor, you can get in touch with me (@IHStreet on Twitter, ihstreet at gmail). Q: What is this meeting you speak of? A: I am so glad you asked – not long ago I had wondered the same thing! The Mechanisms in Plant Development meeting is part of the FASEB Summer Research Conferences (SRC). SRCs are held every other year in a variety of locations across the globe. The Plant Development meeting is usually held in the idyllic setting of Saxtons River, VT at the Vermont Academy boarding school and this year was no exception. 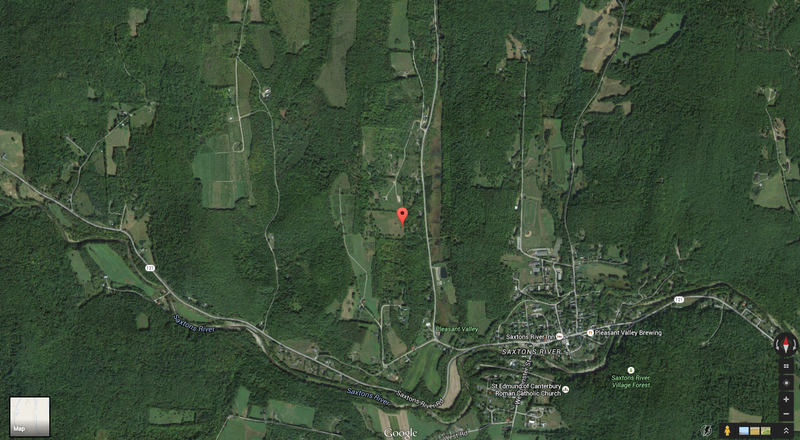 Google Earth image of Saxton River, VT.
Q: Excuse me – did you just say boarding school? A: Ah yes, you’ve just highlighted the biggest hesitation for all attendees. “I have to sleep in a twin bed and share a bathroom with how many people?? ?” There’s no getting past it – that’s what you’ll experience at this meeting (although it is worth noting that you can stay at a local inn, you just won’t get the full experience that way!). So you ask – Is it worth it? ABSOLUTELY! So you ask – Is it worth it? ABSOLUTELY! Q: Ok ok, I’m interested. Why is it worth it? A: Not only are the science presentations spectacular (and I mean spectacular), but also the small meeting environment (~150 people) means that you actually get to meet and talk with speakers and other attendees. The organizers (Dominique Bergmann and Rüdiger Simon this year) have instituted a “lateral inhibition” lunch policy – meaning that invited speakers cannot sit at the same lunch table as other invited speakers. This makes everyone more approachable and gives junior scientists (grad students and postdocs) the chance to meet amazing and talented people when you sit down for lunch. The organizers have instituted a “lateral inhibition” lunch policy – meaning that invited speakers cannot sit at the same lunch table as other invited speakers. Q: What about this spectacular science? Can you highlight some of your favorite talks? A: One of the outstanding features of this meeting was the abundance of unpublished work that was presented. That means I can’t go into too much detail, but I’ll provide some general impressions. First impression is the diversity of model organisms now being used to study plant development. Gone are the days of only Arabidopsis talks – this meeting featured many talks about maize, some about tomato, brachypodium, peach trees, palm oil, bladderworts and more! The second impression is that plant developmental biology is becoming increasingly interdisciplinary. More and more researchers are working to integrate mathematical modeling with experimental validation. First impression is the diversity of model organisms now being used to study plant development. Gone are the days of only Arabidopsis talks – this meeting featured many talks about maize, some about tomato, brachypodium, peach trees, palm oil, bladderworts and more! Jack Schultz from Mizzou gave a talk about the development of insect galls. It turns out that galls are more than just the Agrobacterium crown gall plant biologists generally think of. Insect galls are beautiful and often resemble fruits! Check out some of the great pictures on Jack’s website and follow him on Twitter @jackcschultz. Alexis Maizel from University of Heidelberg is using light sheet microscopy to provide a 4-D view of lateral root development. Check out his work here and follow him on Twitter @AlexisMaizel. Q: The science does sound pretty incredible… But is the meeting all science or do you have some fun too? A: Absolutely! One of my favorite things about this meeting is that there is down time built into the day. In general there was a morning session, lunch, an afternoon break (2-3hours), evening session, dinner and then posters (and a cash bar). Oh and let me take a moment to say that the food was pretty amazing. As in – why do I have to go home I never have this good of food at home – amazing. Anyway, back to the original question – yes there is lots of fun and I didn’t feel like there was too much science being thrown at me. Of course, the final night features a banquet and an all night party. Alexis Maizel shipped his DJ equipment from Germany and we partied like it’s 1999. Then after the dancing portion of the evening the party moves out the fire pit until the wee hours. Q: So what you’re saying is that despite the dorm living, that this meeting is the best of the best for plant developmental biologists? Erin Sparks is a postdoc in the lab of Philip N. Benfey at Duke University.